Need a writing activity for older students that is unique, easy to differentiate, and accomplishes SEVERAL genres of writing? This highly flexible, choice-oriented project gives students 40 prompts across 8 high-interest topics: May, Memorial Day, Summer Countdown, Review, Awareness, Mother’s Day, Father’s Day, and Free Choice. *Wait! 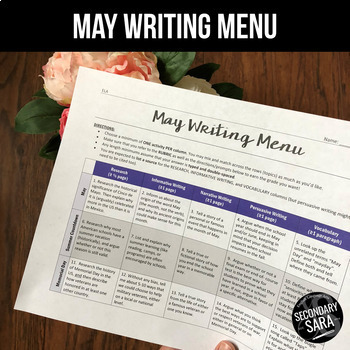 * This item is INCLUDED in my Writing Prompts for Teens Bundle: a YEAR of Choice Menus! Check it out to save 50%!